President Recep Tayyip Erdoğan said on Friday that Turkey would clear Syria’s Manbij of terrorists following Afrin. 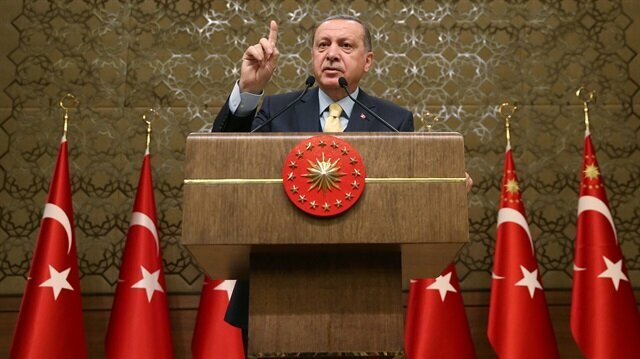 “Turkey's Afrin operation is clear warning to those who don't want to understand Turkey's determination in the fight against terrorism,” Erdoğan said. “Turkey will rid Syria’s Manbij of terrorists following Afrin. Nobody should be bothered by this. Turkey is not occupying Afrin, only fighting against terrorists there,” he added. Turkey launched Operation Olive Branch on Jan. 20 in Afrin to establish security and stability, eliminate terrorists of PKK/KCK/PYD-YPG and Daesh, and save locals from the terrorists’ oppression and cruelty. “We will continue to fight until no terrorist is left on our borders. Our only concern is to ensure our national security and the safety of our citizens and our Syrian brothers and sisters,” Erdoğan said. The president also said that the Turkish military was taking precautions to protect the safety and security of civilians during its Afrin operation. “We will ensure the 3.5 million Syrians in Turkey will be able to return to their homes. This is what the operation aims to do. We are trying to make Afrin livable for the Syrian locals and clear it of terrorists, just as we did in al-Rai and Jarabulus,” Erdoğan said. At least 343 PKK/KCK/PYD-YPG and Daesh terrorists have been neutralized since the beginning of Operation Olive Branch the northwestern Afrin region of Syria. 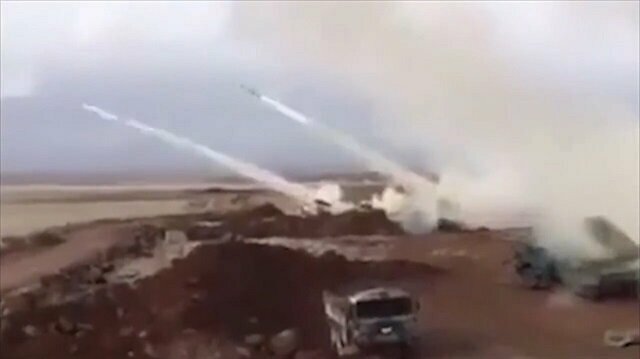 Footage shows Turkish forces using missiles against PYD/PKK terrorists in Afrin. At least 343 PKK/KCK/PYD-YPG and Daesh terrorists have been "neutralized" since the beginning of Operation Olive Branch in northwestern Afrin region of Syria, the military said Friday.Turkish authorities often use the word "neutralized" in their statements to imply that the terrorists in question either surrendered or were killed or captured.Turkish Armed Forces also destroyed 23 targets -- among them weapon pits, shelters, and ammunition depots -- of the PKK/KCK/PYD-YPG and Daesh terrorists Thursday night, the Turkish General Staff said in a statement.The military reiterated that it was showing utmost care to not harm any civilians during the operation. "The only things being targeted are terrorists, and any shelters, pits, weapons, vehicles, and equipment that belong to them," it said.Operation Olive Branch is "successfully continuing as planned", the military added.Turkey on Saturday launched Operation Olive Branch to remove PYD/PKK and Daesh terrorists from Afrin.According to the Turkish General Staff, the operation aims to establish security and stability along Turkish borders and the region as well as to protect the Syrian people from the oppression and cruelty of terrorists.The operation is being carried out under the framework of Turkey’s rights based on international law, UN Security Council’s decisions, self-defense rights under the UN charter and respect for Syria's territorial integrity.Afrin has been a major hideout for the PYD/PKK since July 2012 when the Assad regime in Syria left the city to the terror group without putting up a fight.NATO chief says Turkey has right to self-defensePentagon says not in crisis with Turkey amid Afrin op. Turkey has the right to self-defense like all other countries, NATO’s secretary-general, Jens Stoltenberg, said as Turkey continues targeting terrorist positions in northern Syria.Speaking at a joint news conference with Spanish Prime Minister Mariano Rajoy in Madrid on Thursday, Stoltenberg said: "Turkey suffered most from terrorist attacks over many years.”“And Turkey, as all countries, has the right to self-defense,” he said.Stoltenberg highlighted that this needed to be done “in a proportionate and measured way”.“That is the message I convey every time I discuss this issue with different NATO leaders including the political leadership in Turkey.”Rocket from Syria's Afrin hits Turkish border cityPentagon says not in crisis with Turkey amid Afrin op.State Department Spokesperson calls YPG 'the PKK'Turkey on Saturday launched Operation Olive Branch to remove PYD/PKK and Daesh terrorists from the city of Afrin.According to the Turkish General Staff, the ongoing operation aims to establish security and stability along Turkey’s borders and the region as well as to protect Syrians from the oppression and cruelty of terrorists.The operation is being carried out under the framework of Turkey’s rights based on international law, UN Security Council resolutions, its self-defense rights under the UN Charter and respect for Syria's territorial integrity, it said.The military also said "utmost importance" is being put on not harming civilians.Afrin has been a major hideout for the PYD/PKK since July 2012 when the regime of Syria’s Bashar al-Assad left the city to the terror group without putting up a fight.Stoltenberg recalled his phone conversation with Turkish President Recep Tayyip Erdoğan last week and urged for “direct contacts” between Turkey and the United States to find the best way to address the challenges in northern Syria.The U.S. supports the PYD/PKK, considered by Ankara as the Syrian offshoot of the PKK terror organization that has waged a more than 30-year war against the Turkish state. The terror campaign has resulted in tens of thousands of deaths, including those of women and children.Video: 'Turkey is doing its best to clear terror'American support for the terror group has long vexed Ankara as Washington views the PYD/PKK-led umbrella group, SDF, as a "reliable partner" in its fight against Daesh and continues to provide it with arms and equipment in the face of strong objections from Turkey. Turkey’s envoy to the U.N. on Thursday addressed a UN Security Council meeting and talked about Turkey’s Operation Olive Branch in Afrin, SyriaFeridun Sinirlioglu addressed a U.N. Security Council meeting during which the latest developments in the Middle East were discussed as Turkey holds the term presidency of the Organization of Islamic Cooperation.“The operation is aimed at ensuring border security against the infiltration of Daesh and PKK/PYD/YPG attacks, neutralizing the terrorists in Afrin and rescuing civilians from terror,” Sinirlioglu said.On Saturday, Turkey launched Operation Olive Branch to clear PYD/PKK and Daesh terrorists from Afrin, northwestern Syria.According to the military, the operation aims to establish security and stability along the Turkish borders and the region as well as protect Syrians from terrorist oppression and cruelty.The operation is being carried out under the framework of Turkey's rights based on international law, UN Security Council resolutions, its self-defense rights under the UN charter, and respect for Syria's territorial integrity, it said.The military has also said it is putting the "utmost importance" on not harming any civilians. Afrin has been a major hideout for the PYD/PKK since July 2012, when the Assad regime in Syria left the city to the terror group without putting up a fight.